I told you I was on a Thai food kick. In case you missed the other two recipes I recently shared there’s these Thai Basil Beef Bowls and this Thai Slaw with Peanut Dressing so be sure to try those out too! 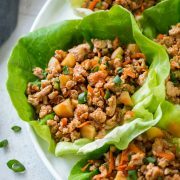 These Thai Chicken Lettuce Wraps are everything I’d hoped they’d be and then some! They are so flavorful and easy to throw together and they have the perfect crunch factor! 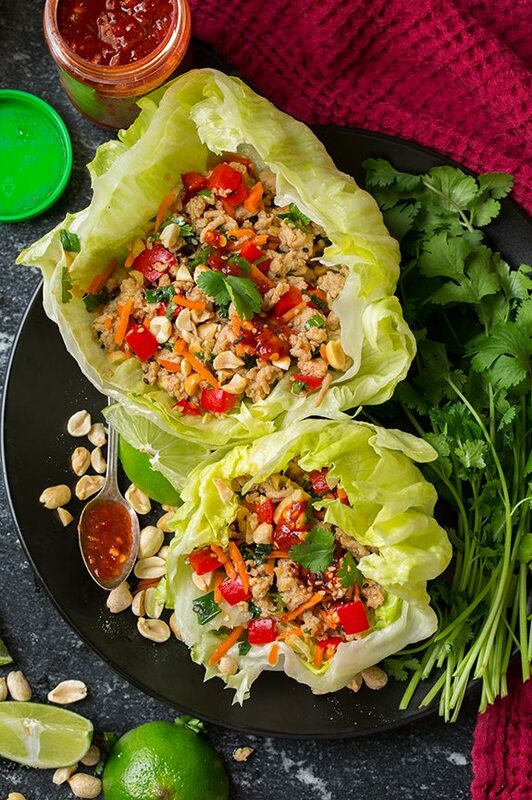 I don’t usually do lettuce wraps for dinner because they aren’t filling enough for me, but these are so happening all the time for dinner (I’ll probably just serve them with a side of rice for a more filling meal – because I need my carbs). You can adjust the sauce here to suite your taste. If you love fish sauce add more, if you want them salty you can use regular soy sauce. If you love heat load them up with the Sambal Oelek, like I did (the stuff is amazing!). 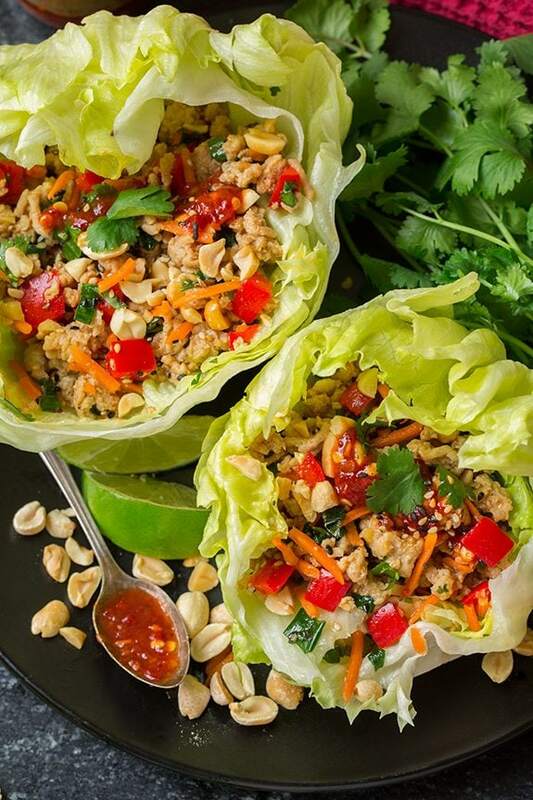 Whatever you do I don’t recommend leaving out any ingredients, everything comes together perfectly here to create a truly tasty, satisfying, veggie and chicken filled lettuce wrap that’s perfect for serving any day of the week! 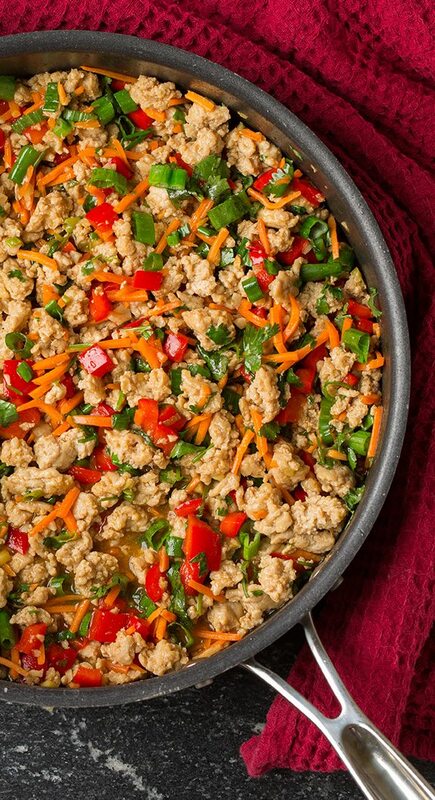 Lean ground chicken and fresh veggies are cooked in a skillet and tossed with a deliciously flavorful Thai style sauce. Then peanuts are tossed in for a nice crunch, and the filling is layered in lettuce leaves and topped with asian hot sauce. So tasty! 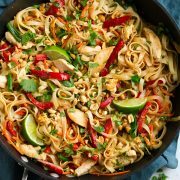 In a small mixing bowl whisk together soy sauce, fish sauce, brown sugar, lime juice, sesame oil and cornstarch, set aside. Heat oil in a large non-stick skillet over medium-high heat. 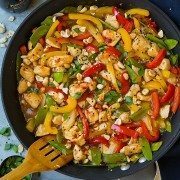 Add lighter portions of green onions, garlic and ginger and saute 30 seconds, then add chicken and cook, tossing and breaking up chicken occasionally until nearly cooked through (don't drain). Add red bell pepper and cook until just slightly softened, about 2 minutes. Add carrots and darker portions of green onions, then whisk sauce mixture once more and pour into skillet. Cook, tossing frequently until sauce has thickened (and chicken is fully cooked through), about 1 minute, taste and season with a little salt if needed. Add in cilantro, green onion greens and peanuts. Serve warm over whole lettuce leaves with Sambal Oelek if desired.